Provides Maximum Support and Stability. 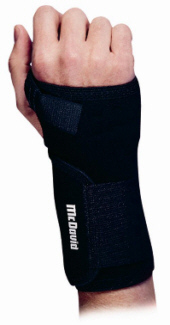 The McDavid Carpal Tunnel Wrist Support is recommended by doctors for back to work or play rehabilitation. This popular support features thermal neoprene with nylon on both sides, fully adjustable Velcro® closures and a removable medical grade splint for superior support. Retains warmth, provides support, promotes healing. Firm compression and soft tissue support relieves pain from carpal tunnel, arthritis, tendonitis and sprains. Provides support, protection, and pain relief. Right and left hand sold separately.